It was 16 degrees and time to take a look at a little spot on the Credit River which is home to the oldest house in Mississauga. We parked in the parking lot of the Leslie Log House which is now located on the former J. H. Pinchin and Sons Apple and Turkey Farms. John and Esther Leslie came to Upper Canada in 1824 and leased 200 acres in the area now known as Meadowvale. This 26 foot by 36 foot house was where they started their family of seven children. Their son Robert Leslie was a master builder who is credited with building several local houses which have been featured in previous posts. 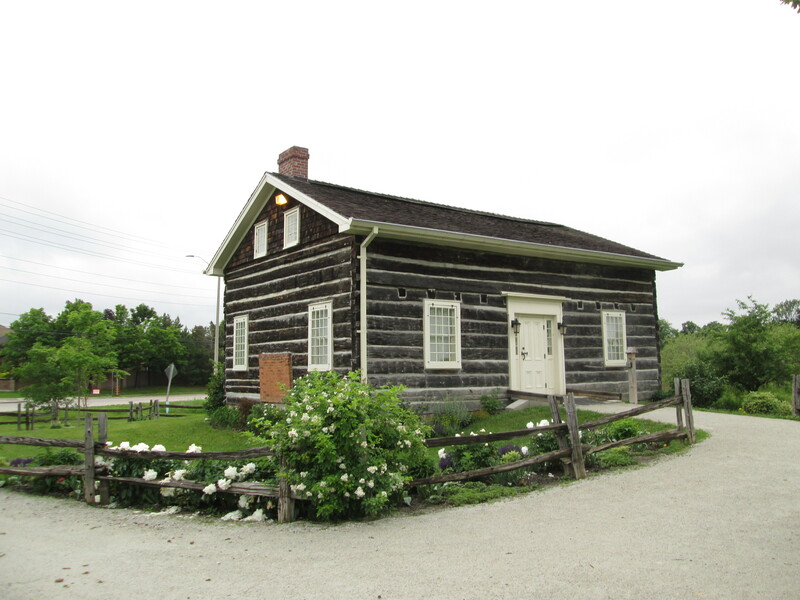 Robert built the Barber house in Streetsville and the Hammond house in Erindale. Another of their sons, George, moved to the area east of the Don River in Toronto which is now known as Leslieville. The log house was moved to this location in 1994 because it’s original farmstead had been redeveloped for industrial uses. The house is now in use as the home of The Streetsville Historical Society. In the back yard behind the Leslie log house is a shed that looks like an outhouse. 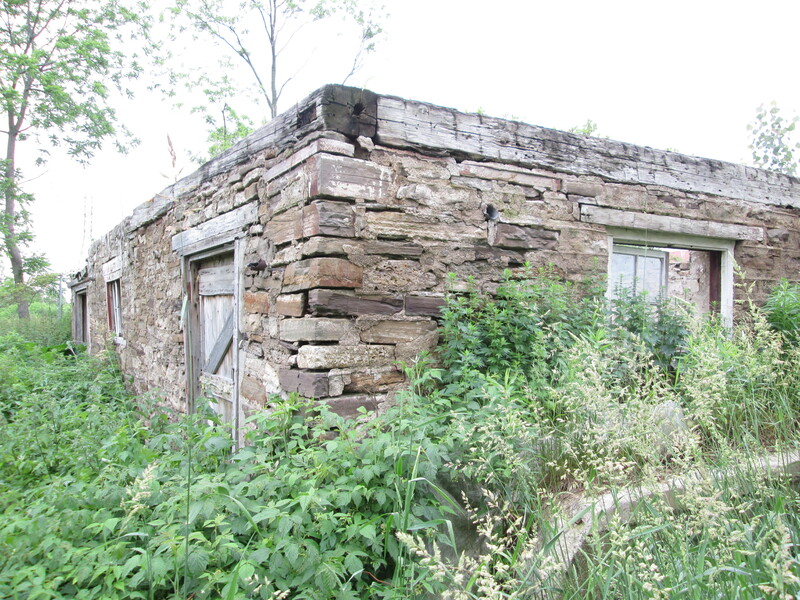 This farm was settled in 1833 and like other older properties it may have had several outhouse positions over the years. As holes were filled with waste a new hole was dug and the shed moved over it. There is a group of bottle collectors who seek out old outhouse locations and re-dig the holes. Very often old medicine bottles were dropped into the outhouse hole for disposal before the days of organized garbage collection. The bottle had a soft landing and frequently survived intact. The contents of the hole turns to soil over time much like fertilizer in the garden. I’ve never gone digging for bottles but have seen pictures of some pretty amazing finds including a gold pocket watch that likely elicited a curse as it fell. 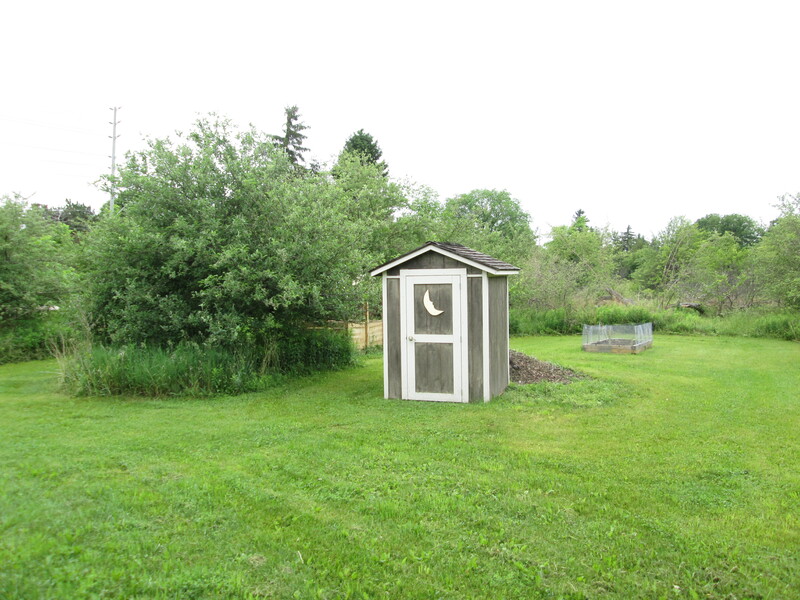 Outhouses were freezing cold in winter, smelly in summer and full of bugs. I’m thinking that reading in the washroom is a modern invention. Behind the Leslie house are the foundations from a small barn or shed that originally belonged to the Pinchin Family. James Herbert Pinchin bought this farm in 1926 and named it Riviere Farms. He raised apples and turkeys and children. In 1927 J.H. Pinchin was the secretary of the Clarkson-Dixie Fruit and Vegetable Farmer’s Co-Op. He held the position of secretary until at least 1939. The foundations of this building are field stone collected from around the farm when the land was cleared. Farmers collected stones every spring from their fields and used them for fences, foundations and sometimes entire buildings. Angelica is one of several plants which are similar in appearance. 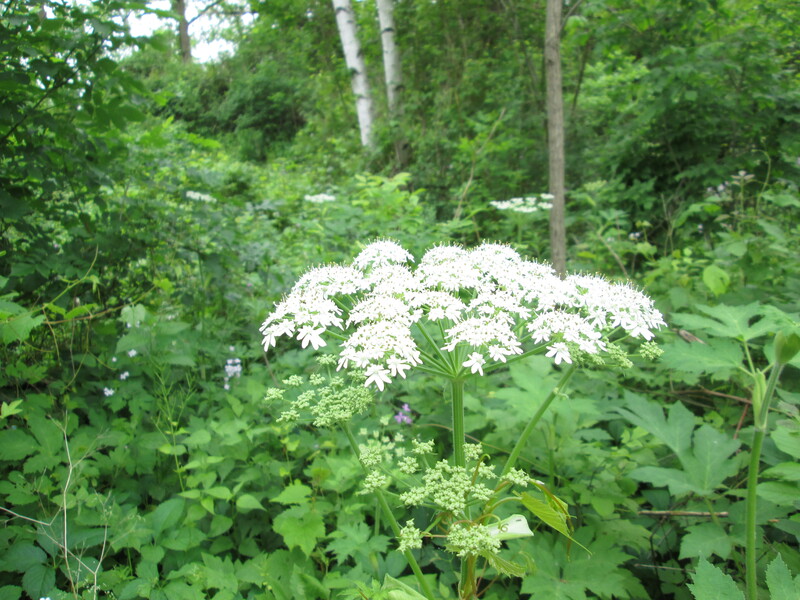 The toxic Giant Hogweed looks almost the same but grows much taller. Queen Anne’s Lace is another similar plant which is smaller. All of these plants should be avoided if you are unsure of the identification because of the dangerous burns the giant hogweed plant can inflict. 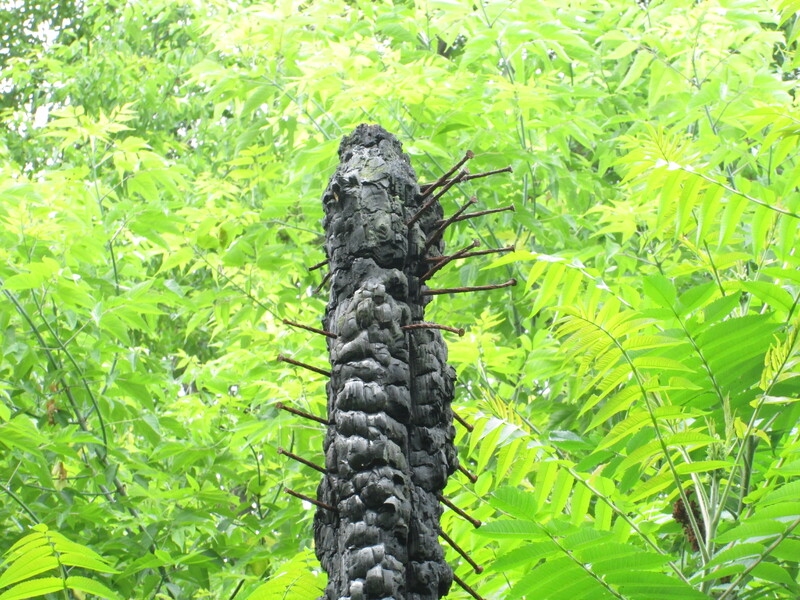 As you follow the curve of the river downstream you come to a series of burned out wooden posts standing like sentinels in the trees. These small trees have grown up inside the foundations of a former turkey barn. The barn is in the 1971 aerial photo but must have burned down some time shortly thereafter based on the way the forest is taking over again. 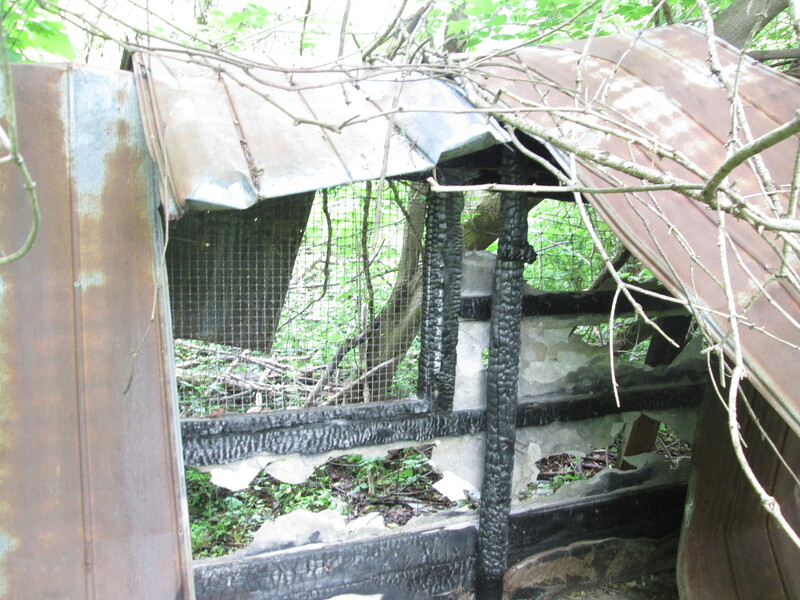 The old turkey barn has some of its original cages still intact. In May 1927 James Pinchin announced in the Credit News that the Farmer’s Co-op had secured the rights to use the Bean Power Sprayer between Islington and Oakville. When John Bean retired in 1880 he bought a ten acre almond orchard in California. He found that he had to spray for bugs but that no suitable sprayer existed. So he invented one and started manufacturing them in 1885. Very soon the company became the largest manufacturer of orchard spray equipment in the world. Behind the remains of the burned out turkey barn is the remains of a Bean power sprayer. If you are thinking about exploring this location please take note of the number of nails in this support beam from the old turkey barn and choose your footwear carefully. 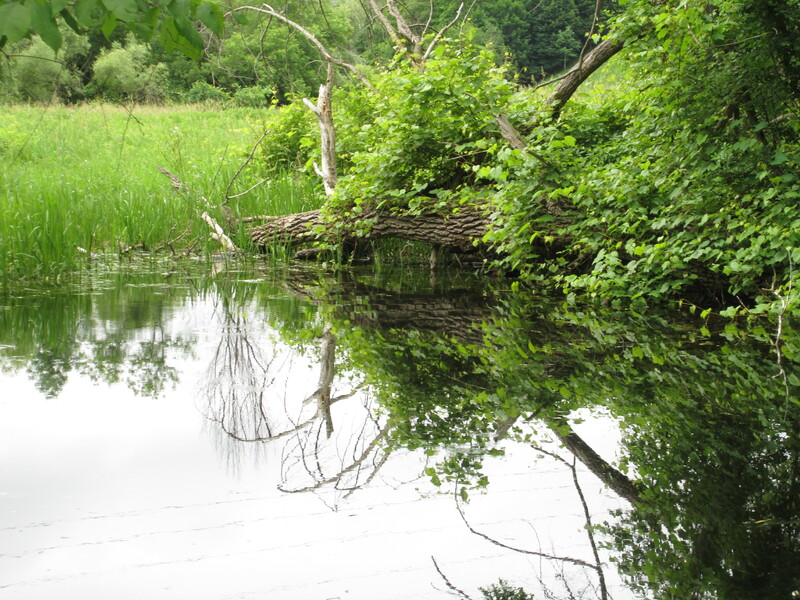 The Pinchin family lived on this farm for about 90 years and when you see the beauty of the property and the Credit River that flows through it you can understand why. Victor Pichin took over running the farm from his father and continued until around 2010. Victor moved to the retirement home across the street where he passed away in his 93rd year. The orchards must have looked and smelled amazing a month ago when the apple, pear and plum trees were all in blossom. For 90 years people came to this farm for the “pick your own” fruit or to get their holiday turkeys. Today, the property belongs to the City of Mississauga and it is not clear what they will eventually do with it. So far they have torn down several buildings which is not a great start. 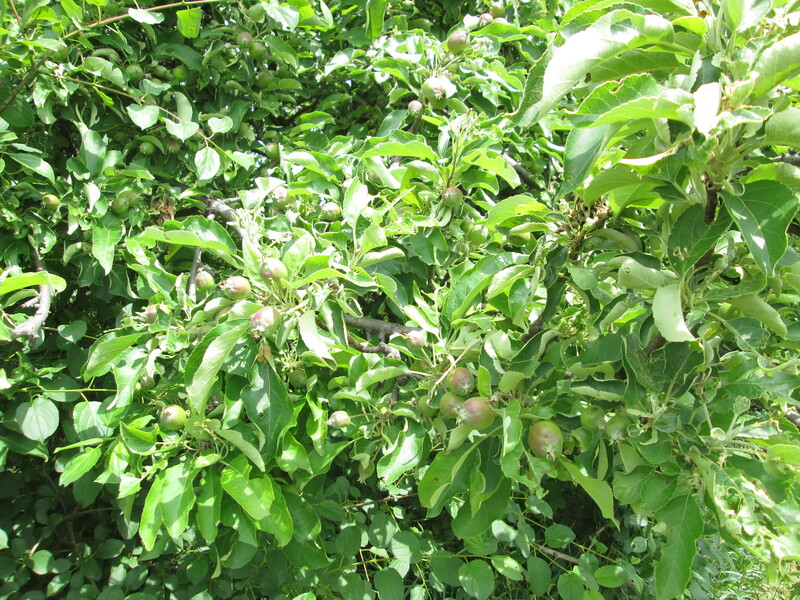 The trees in the orchard are loaded with this year’s crop of fruit. It was reported that the farm produced 400 bushels of fruit per acre when it was in operation. 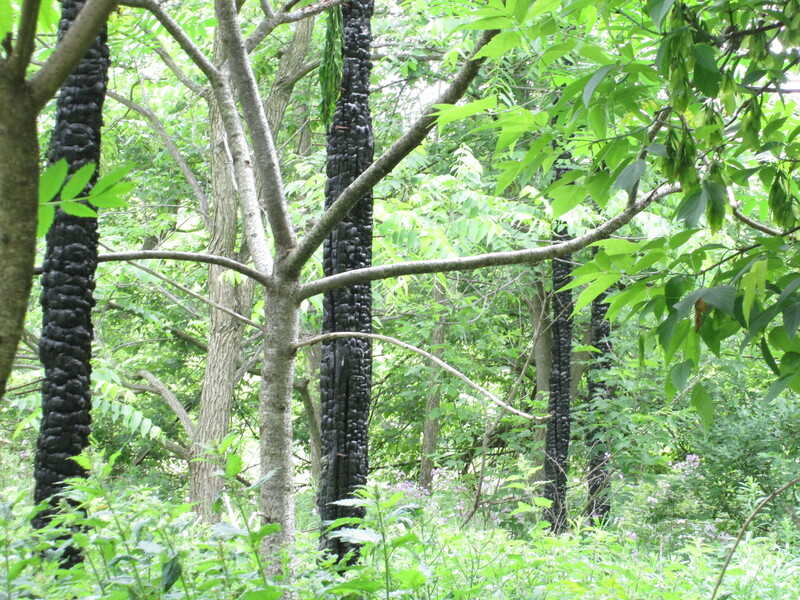 This entry was posted in Credit River and tagged Apple Farm, Barn Fire, Bean Sprayer, Leslie Log House, Pinchin Apple, Turkey Farm on June 18, 2015 by hikingthegta. THANKS for this Pinchin article. I remember those apple crates. 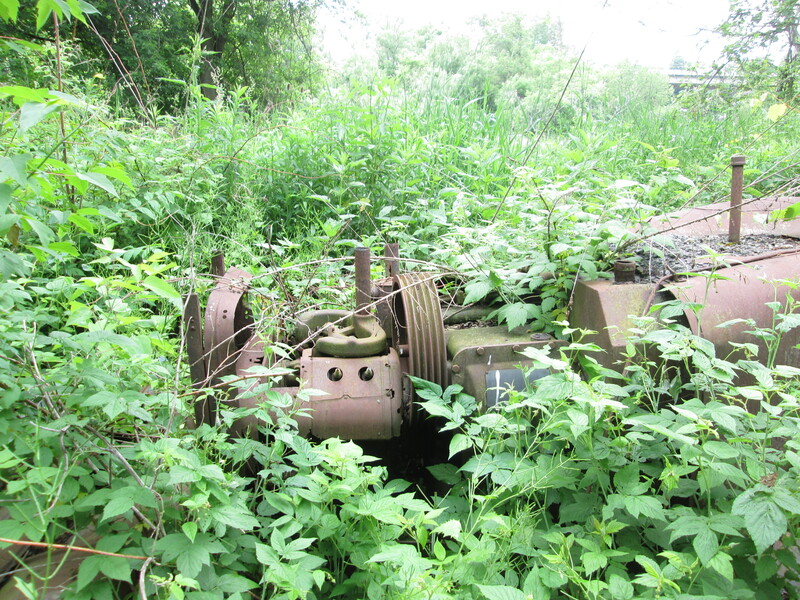 They used to be stored in the metal barn (still there) by the 403. Where did you see this one? How you identified the Bean Sprayer, I’ll never know.